Our design for the new RHS National Centre for Horticultural Science and Learning on the Hilltop at Wisley, the World Food Garden will form a ‘living laboratory’ when it opens in spring 2020. Inspiration has been drawn from the traditional large vegetable garden, but delights in embracing the UK’s exciting new innovations and cultural shifts in ’grow your own’, to form a truly contemporary plot to plate experience. Garden compartments where one can discover a wealth of growing, cooking and eating opportunities, with plenty of contemporary twists, will teach and inform in an approachable, accessible way – no matter a visitor’s culture, age, horticultural interest or experience. We hope our work will be a valuable tool in allowing the RHS to share their expert knowledge in preserving and progressing the science, art and practice of horticulture, and that they be enjoyed by future generations both urban and rural, to enhance our shared global environment. A central axis drives into the heart of the space, is lined with edible, annual and perennial flowers, and overhead pergolas are clothed with vegetables and fruit ripe for the plucking. A maze world kitchen garden with demonstration outdoor kitchen takes you on a journey of edible discovery. 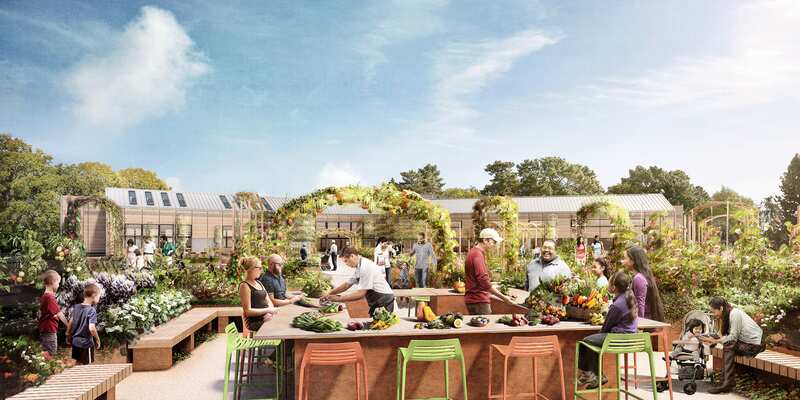 Each bed is linked by an overhead arch symbolising the linking of culinary communities worldwide, whilst framing the decorative nature of more unusual vegetable and fruit varieties. The trial vegetable gardens highlight the champion plants of the RHS Vegetable trials. These beds are inspired by the structure of cells, with contemporary trained fruit supports to give height and structure. The café garden with its zones of planting suitable for food, juicing, and cocktails (!!) will be a colourful, plentiful space to tempt the taste buds and the urge to grow your own supper at home. Our design is a chocolate box of cultivars, distilling the cream of edible crops showing not only what’s best to grow, but which plants are most likely to succeed once back in your own garden at home. Working alongside the RHS Wisley edibles team is a joy, and as a team we hope to share and maximise the impact of today’s food stories, and create new ones.